Summer roadtrip: Driving to "West Dakota"
Callan Bentley, Geotimes contributing writer, has been traveling across North America in his Volkswagen Westfalia camper van this summer. Since May, he has been logging miles from Washington, D.C., up to central Alaska, and will soon be heading back. When he comes across areas with interesting geology, he uses the van's solar power to plug into a laptop and fire off a dispatch for Geotimes. The following is Part I of his three-part roadtrip series. For those with an interest in all things geologic, the western portion of South Dakota and the adjacent area of eastern Wyoming are wonderful spots to visit. From Badlands National Park through the Black Hills to Devils Tower, four hours of driving generates a roadtrip through a region that has much to entertain geo-philic travelers. 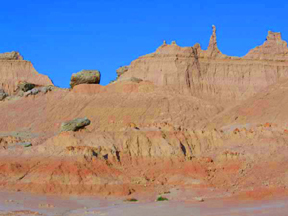 Erosion by infrequent rainfall dissects the sediments and volcanic ash of Badlands National Park in South Dakota, into weird and exotic shapes. All photos are by Callan Bentley. attraction every year. This past year, an animatronic Tyrannosaurus rex was added to the lineup to commemorate the former reptilian residents of the area. If you have a sense of irony, it's worth stopping just to watch this lethargic model "roar." Also in the town of Wall, and positively neglected by comparison, is the visitor center for the National Grasslands, 4 million acres of publicly owned prairie administered by the U.S. Department of Agriculture. Specific information is available on nearby Buffalo Gap National Grassland, as well as the entire system of public lands. South of the road near Wall is Badlands National Park, an excellent example of badlands topography, a characteristic landscape that results when loosely cemented sediments in arid locations are dissected by periodic rainfall. The sediments range in age from Cretaceous to Miocene. The oldest deposits are associated with the Western Interior Seaway, a body of seawater that stretched from the Gulf of Mexico to the Arctic Ocean from about 140 million to 60 million years ago. Fossils of baculites  ammonoids with straight, not spiral, shells  mingle with vertebrates like pteradons, mosasaurs and the giant turtle Archelon. This model in the Ben Reifel Visitor Center in Badlands National Park, S.D., shows Archaeotherium, an ancient animal related to pigs, but with carnivorous habits, whose remains are among the many Oligocene mammals found in the Badlands. The area is also rich in fossils from the early Cenozoic, including a treasure trove of mammals from the Oligocene (34 million to 25 million years ago). 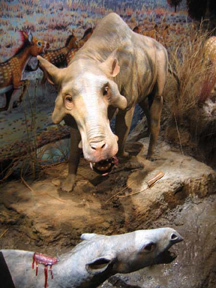 For instance, Archaeotherium was an ancient relative of pigs, and the site from which its fossils have been extracted is affectionately known as the "Big Pig Dig." Alongside Archaeotherium were ancient camels, rhinos, dogs, horses and even a boa constrictor! Fossil casts, videos and life-sized reconstructions of all of these critters are on display in the excellent Ben Reifel Visitor Center near Interior, S.D., which is truly a notch above most park visitor centers. An excellent stratigraphic display describes how each geologic layer was deposited, what fossils it contains and how geologists study it. When the Badlands have finished working their arid magic on you, it may be time to head for the hills. Higher and cooler than the surrounding Great Plains, the Black Hills are "black" because of the dark color of the coniferous trees that cloak their flanks. Geologically, the Black Hills are a massive upwarping of rock layers called a dome. The outermost (youngest) layers of the dome have been breached in the center, exposing a granite core surrounded by a bullseye ring of sedimentary rocks. To learn more about the hills, you should spend an hour or two at the museum of the South Dakota School of Mining and Technology in downtown Rapid City. Watch out for motorcycles  nearby Sturgis, S.D., is host to an annual gathering of Harley-Davidson enthusiasts, which ensures that year-round, loud "hogs" will be throttling through the streets of Rapid City. Mount Rushmore is intended as a patriotic tribute, but it is also interesting for revealing the contact between the Harney Peak granite (light-colored), and the darker metamorphic rocks it cuts across. The Harney Peak granite, at the center of the Black Hills, is the raw material from which nearby Mount Rushmore was carved (also the raw material from the nearby Crazy Horse; see Geotimes, June 2004). Carved by Gutzon Borglum (and his son Lincoln Borglum) between 1927 and 1941, Mount Rushmore depicts the likenesses of four cherished American presidents in much-larger-than-life busts. Getting to see the busts, however, is a trial by fire. The National Park Service has turned over the management of the site (a National Memorial) to a private concessionaire, which has built a massive parking garage in front of the mountain. The visitor's first experience is therefore paying $8 for the privilege of searching for a parking space. If you pass through the parking gauntlet, however, you will be able to join the throngs of flag-waving Americans who stare up at the mountain and take identical digital photographs of the sculpture. 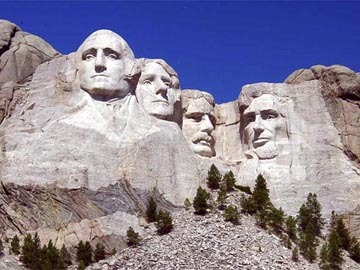 Geologists may get more out of the experience because their trained eyes will pick out dikes of lighter colored granite that arc through the presidents' faces, and the contact between the granite and darker-colored schist and gneiss at the base of the mountain (about halfway down George Washington's chest). Devils Tower in Wyoming is an intrusion of the igneous rock phonolite which exhibits terrific examples of columnar jointing. Devils Tower exhibits a world-class example of columnar jointing, the formation of tall columns of rock as they cool (and thereby lose volume) from liquid magma. Hosted by sedimentary layers (Jurassic and Triassic sandstones and siltstones), the magma solidified at about 1.5 kilometers in depth, approximately 50 million years ago. Whether it was originally a volcanic neck, a laccolith (mushroom-shaped intrusion), or simply a blob-shaped magma chamber remains a matter of intriguing debate. 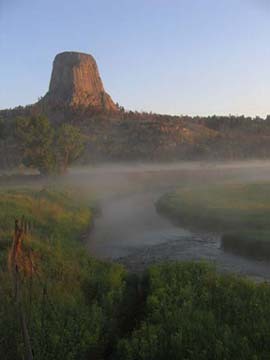 Devils Tower is there for us to see because the Belle Fourche River removed the overlying sediments and exposed the rock, as it carved through the landscape. It's a delightful place to go  very quiet and peaceful, a world apart from the melee at Mount Rushmore. Even if you're not a fan of Close Encounters of the Third Kind (which Stephen Speilberg filmed at Devils Tower in 1977), few experiences can be more satisfying than contemplating the great stump of rock in the warm light of sunset.